Mitzi Morris, DMD, PC is pleased to offer expert root canals therapy as part our general dental care to the residents of Roswell and the surrounding communities in North Atlanta. A root canal is a dental procedure that can be used to save or restore a tooth that has been damaged due to decay, infection or trauma. It involves removing the infected or damaged nerve and pulp from the center of the affected tooth, cleaning the area and then sealing it off to prevent further infection. As a board certified Doctor of Dental Medicine, Dr. Morris is highly qualified to perform root canals. Using this restorative dental procedure, we have restored the teeth of countless individuals in Roswell and the surrounding areas. Despite what you might have heard, root canals can be painless. 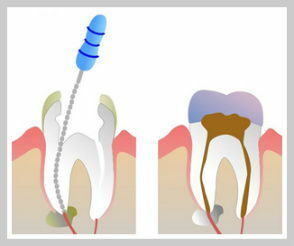 In fact, a root canal procedure can be used to eliminate the pain that is being caused by an infected tooth. For your comfort, we offer several anesthetic alternatives ranging from local anesthesia to sedation dentistry (Nitrous Oxide). Our dentist and staff are deeply committed to making your dental experience as positive and as comfortable as possible. If you are in need of a root canal treatment, Dr. Morris can recommend the most appropriate form or forms of anesthesia to suit your individual needs. Dr. Mitzi Morris is an experienced root canal dentist you can trust to provide state-of-the-art, compassionate dental care. Don’t put off a needed root canal procedure. Delaying treatment will only lead to more serious, painful and expensive dental problems. If you are insured under a dental insurance plan, we will be happy to file your claims or to assist you in collecting payment. We also accept credit card payments and offer financing through CareCredit. Contact our Roswell Root Canals Dentist today to schedule an appointment with Dr. Morris. We look forward to restoring your dental health.